On-board entertainment for an Air Asia flight. 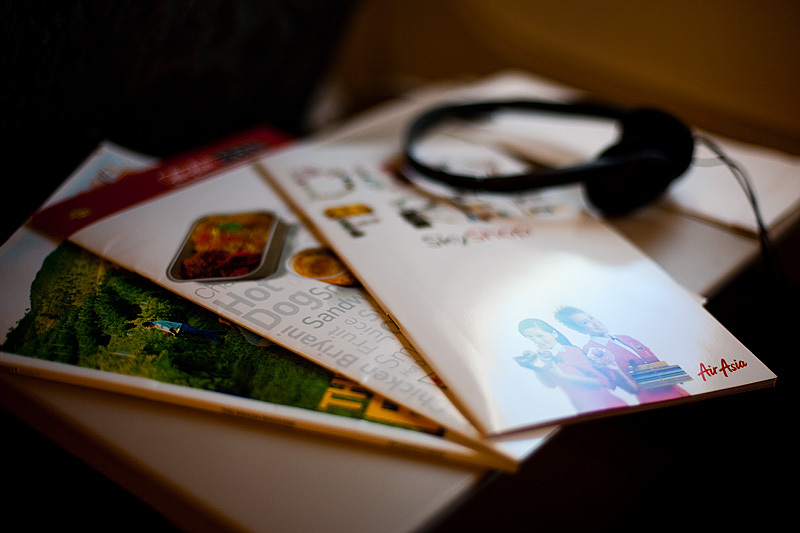 The skimpy literature displayed before you is supposed to keep a customer busy for the duration of a 14 hour flight between Kuala Lumpur and London. Air Asia is a successful Malaysian budget airlines that recently began inexpensive long haul flights to non-Asian destinations. Consequently, there are no traditional forms of on-board entertainment including 3rd rate Hollywood flops and straight to airlines TV series (e.g. "Everybody Loves Raymond" and "Everybody Hates Chris"). What the flight lacks in meals, movies and music, you make up for in price. I shelled out approximately $200 for a one way ticket from Kuala Lumpur to London (Stansted). On a travel note, I'm leaving Asia for some time and will base myself in Antwerp, Belgium for some time to come. With the low costs of European budget airlines, hopefully I'll be taking many short trips to nearby European countries and North Africa, enshallah. This flight (pictured above) to London is part of my epic journey that involved nearly every form of modern transportation except passenger ferry. 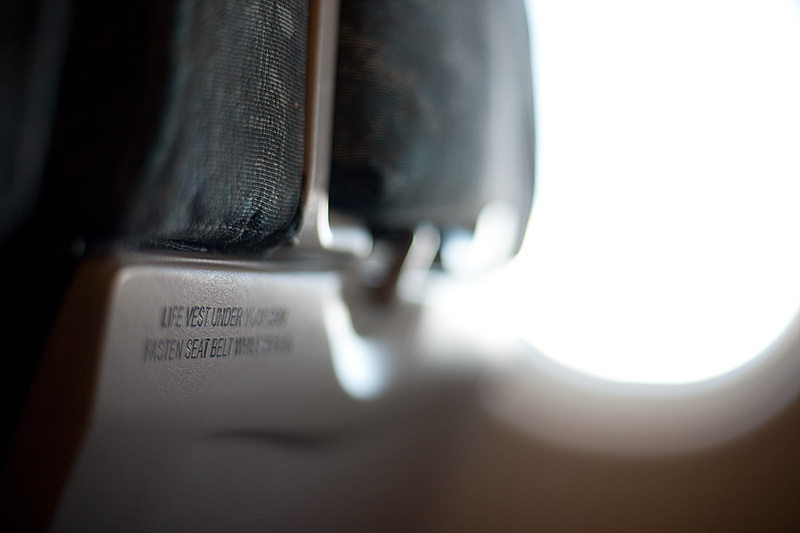 Seat tray in locked and upright position. I can't pinpoint the exact date but some time after I became serious about photography, I began to take notice of minute details with a new photographer's eye. I'd never noticed seat trays had this writing carved into them until a couple years ago. That's part of the reason I'm returning to countries I'd previously visited, before I'd developed an interest in photography. And this is one of the reasons that brings me back to Europe, a place I'd last visited in-depth 12 years earlier. 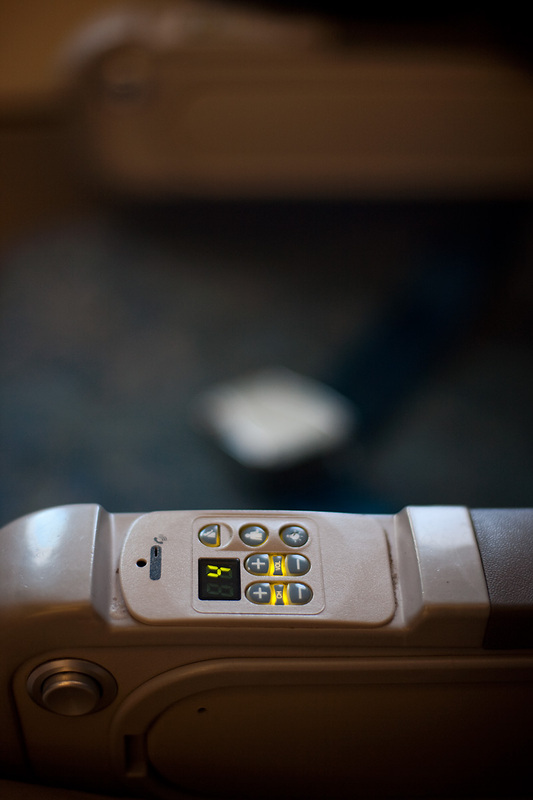 An airplane armrest displays the channel number and various buttons for a TV that doesn't exist. Lucky for me the 14 hour flight to London was half empty. I was able to remove the vestigial armrest partition to grab some shuteye in a near-perfect fetal position. It was a rest I would need because I'd planned to stay overnight at Stansted airport to catch my 6am flight to Eindhoven, Holland. I'm glad to arrive in Antwerp. Photos of this city to come tomorrow! what kind of lens were you using for these?